Whilst this blog has always featured news and tips for high performance sailing (ok, two man high performance sailing), I thought it was about time that we started to cater for all of you guys sailing singlehanders. 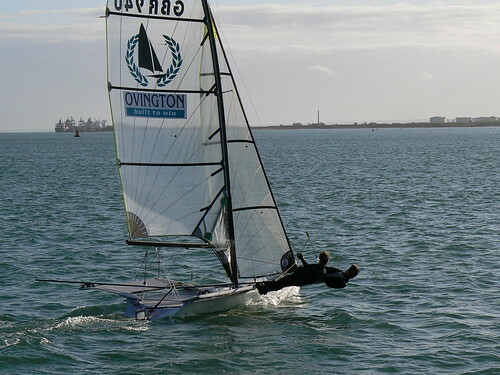 With this in mind, I’ve persuaded multiple Laser Radial National Champion Jon Emmett to provide some top level coaching tips and advice for singlehander sailors. Over the next few months we’ll be featuring several blog posts from Jon, including training and techniques for starting, upwind technique and tactics. Furthermore, he’ll be reporting on his Laser Radial events to keep everyone interested in between these posts. The latest America’s cup news is that, thanks to the New York Supreme Court, Alinghi has to stop messing around with their fake sailing club and sail the event in either Valencia, or the Southern Hemisphere. My personal vote goes for an event in Cape Town..
After the hearing, Lucien Masmejan said: “This is a disappointing result as we were certain that Justice Cahn’s May 2008 decision allowed the Defender to chose Valencia or ‘any other location’,” said Lucien Masmejan, Société Nautique de Genève (SNG) legal counsel. “Ras Al Khaimah has put enormous time and effort into this 33rd America’s Cup project. We thank them and feel sorry for this unexpected result out of the New York court”. I’m no legal expert, so I wouldn’t dare to comment on the actual ruling, but I’m just happy that it has gone against Alinghi. Over the last few years, Alinghi have worked hard to ruin the reputation of the America’s Cup and have caused a backlash against sailing in general. It would be nice for them to stop changing the rules, get on the water, and sail. Lawyers should be left well at home. Finally, heres a reminder to all Alinghi fans, sailors and America’s cup viewers. Alinghi are a great team and have built some beautiful boats. I’m looking forward to seeing them on the water competing at the next AC. This is what we are here for. As every one knows, Twitter is the latest web phenomenon and the 3rd biggest reason to get online, closely beaten by Googling your own name (who hasn’t done this? ), and in number 1 spot, looking at naked girls. I’ve been on Twitter since before it was cool (many will argue that it’s not currently cool, but if you go and ask my 200 Twitter friends they’ll tell you otherwise) yet I realised today that I’ve never really mentioned it on the blog. I may only write a new blog post once a week (ok, once a month…), but I write a lot more on Twitter so some of you may find it useful. Many of you won’t find it useful at all, however, but come and follow me anyway. I get a lot of traffic to this site searching for online sailing games. I’ve decided to help these people out by giving a round up of some fantastic online sailing games. Ok, they don’t replace the real thing, but when you’re stuck at work and have nothing better to do than stare out of the window, then maybe it’s time to give one of these a shot. SailX is probably the most popular option. Whilst at first look it seems pretty boring, when you scratch the surface you’ll find a smooth running, highly complex sailing simulation that covers most aspects of our sport. If you’re into laser sailing, you’re in the right place. 29er’s your thing? then they have you covered. How about keel boats? Yep, all in there.